From time to time I will find a CSV out there on the web ready for consumption (Lucky). Using Python you can easily consume the data with a few lines of code and then do your thing. So using python and the URLLIB2 module you can hit the CSV, convert it to a string, and then output it out to whatever CSV file you want. This will allow you to massage the data before moving on using Python. Handy if you need to remove feilds, convert data, etc. I connect to a database using the pyodbc module and then execute the stored procedure detailed below. Once we have the CSV file downloaded we can use BULK INSERT to throw the data into a SQL Server database for us. Sometimes you get real lucky and you can just do a straight insert into the database. As you work with more and more data you realize that is usually not the case. The procedure below includes a quick and dirty column conversion on the location column. The data source decided to wrap quotes around the location column only. Since it was at the end of the file and I did not need the last column, a REPLACE was used and a cludgy hack was born to combine the last two columns. This works for this data load, but you may not be so fortunate and other manipulations may need done to your data. You may be asking, "Why not just go to the USGS web site to view this data. The map is already made, searchable, etc." That is a really great question, and for most people that is the way to go. Just use the site. However grabbing the data allows you to do other fun stuff that you cannot do through the web site. Combine this data with the previously blogged about GPS distance calculations using SQL Server and you can build a script to Tweet when an earthquake happens within a 250 mile radius of some given point. Stuff like that. With the NFL down to its final game, I needed a new sport to start projecting the games using Log5 and Pythagorean wins. Next up, NBA. One cool thing about the NBA is the sheer volume of games. The projection calculations can get a good workout selecting daily winners. I started piecing together the scripts and infrastructure needed to project the daily outcomes using Python. The projections are calculated like my NFL POW using both Neutral Court and Home Court Advantages. I am using 60.5% as the Home Court Advantage factor. The Pythagorean projection had the teams matched up a little closer. 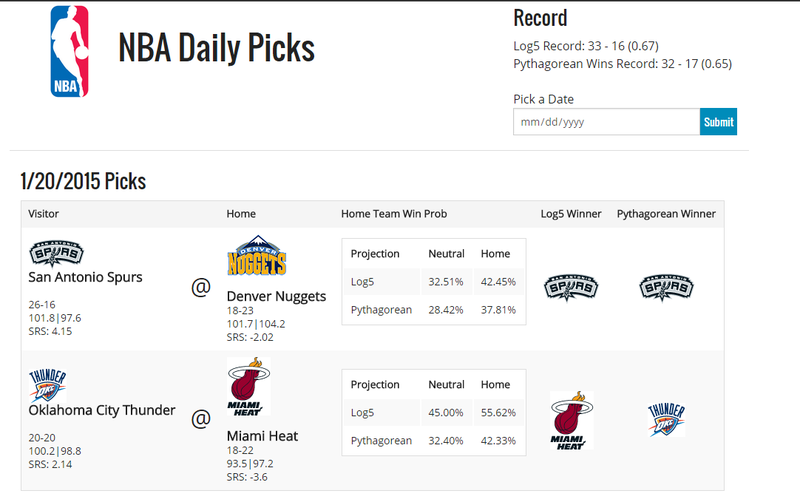 The Log5 projection on this game had the Bulls winning, whereas the Pythagorean projection correctly projected the Cavs would win. Both projections were near 50% indicating the game should have been close and should have been a good game. Cavs out performed expectations and blew the bulls out by 14. Here is an example where both projections got it wrong. Both projections are close to 50% so its not a huge disappointment here. Sometimes things just happen. Even the Knicks have to win some games. The Knicks pull off a stunning victory. I turned the projection system on for the 1/14/2015 games. Here is the current overall record. We'll see how well the projections perform over the next few weeks. I plan to setup something for baseball too. The projection methods do not agree on the winner of the Heat/Thunder game this evening. We'll see which one is correct. As I blogged earlier I wrote a series of scripts to grab NFL game results data, points for/against, and the various records of NFL teams in an attempt to predict the winners of the weekly NFL matchups. This was a straight head to head pickem (no spread picks) to determine the winner of the matchup. The projections were handled using Log5 and the Pythagorean Wins Expectations calculations. The projections were started week 11. So how did I do? Week 11 and Week 16 were the worst, however I did not have a single losing week. What teams were the most difficult to project? I used the Pythagorean Wins Expectations calculations for my actual matchup picks. If I used Log 5 to project the winners I would have missed 3 more picks on the year. Therefore the Log 5 win percentage was 64.2%. The Philadelphia Eagles caused the projections the most grief showing up on both the Log 5 and Pyth top Wrong list. What does that mean? It basically means the Eagles lost about 4 games they should not have lost. However if we look closer only 2 of those games really stand out as terrible. The week 16 debacle against the Redskins is Exhibit A in the Eagles bad second half of the season. According to the Pythagorean Projection the Redskins had a 26.91% chance of winning that game. The week 11 showdown with the Packers was absolutely ugly with a final score of 53-20. The Packers were given a slight edge in the projection 54.85%. So the game should have been a lot closer than the score. The Cowboys loss in week 15 was a lot closer. Pythagorean projection stated the Eagles had a 62.95% chance of winning the game and the Cowboys pulled ahead late in the game. Same story with the Week 14 Seahawks game. The projection had the Eagles with a 55.87% chance to win against Seattle. All of these teams are playoff teams. Looking at the Eagles entire schedule you see one loss from a non-playoff team and that is the Week 4 loss at San Francisco by less than one score. The Eagles did not make the playoffs, but if you throw out the Redskins game, they had a great season considering their opponents and outcomes. I have a few things to work on for next year. I need to solve some current week logic. I had some issues with the system recognizing the current NFL week. I may create a week table so it will just pick from a list. Also I would like to automate it from end to end. I have been executing the scripts and such manually to make sure everything was working. Here is a YouTube video I put together on a sample way to scrape data from a website using BeautifulSoup. As we ring in another year we here at thejoestory tech embark on a new culinary quest. The Homemade Hummus Quest challenge of 2015. Each month we will try a new recipe in an effort to find the best tasting, easy prep cost effective homemade hummus. Each recipe will contain a grand total of 5 ingredients. Of course what would be a new thejoestory tech quest without a website to go with it? Here you will find each recipe, pictures, date prepared and an overall rating of each hummus recipe. This month we tried Pesto Hummus. Again we are working to keep cost low, prep easy, and taste high. I used a pesto pouch from the seasoning aisle and some of the finest Always Save Grated Aged Parmesan cheese. Of course we could step up our game on the quality of ingredients and I am sure the outcome would be better. However one of the goals of the Hummus Quest 2015 is to keep costs down and preparation as easy as possible. Here at thejoestory tech we like sweet tea...a lot. 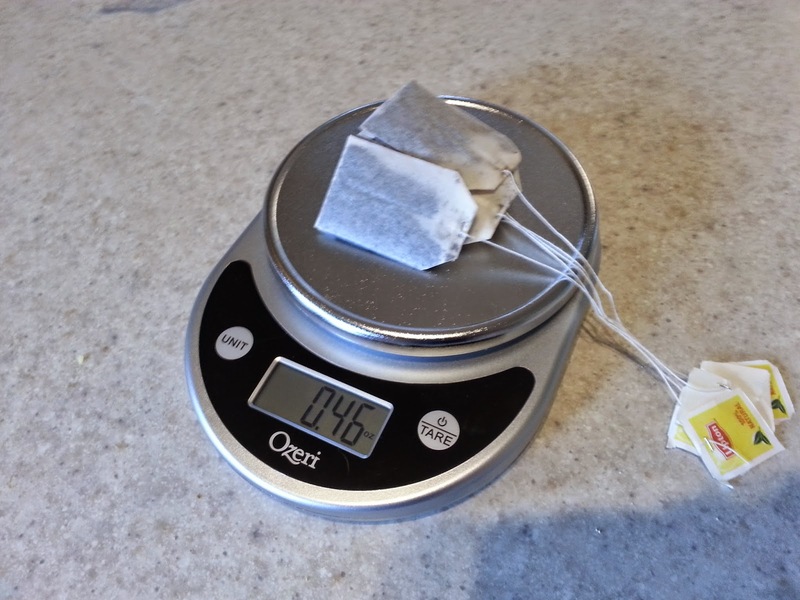 I couldn't think of a better way to take our new digital kitchen scale for a test spin. Heat two cups of water in a microwave safe measuring cup for 2 minutes and 45 seconds. While waiting for water to heat un-package the tea and tie a fancy knot (optional) to ease bag removal. 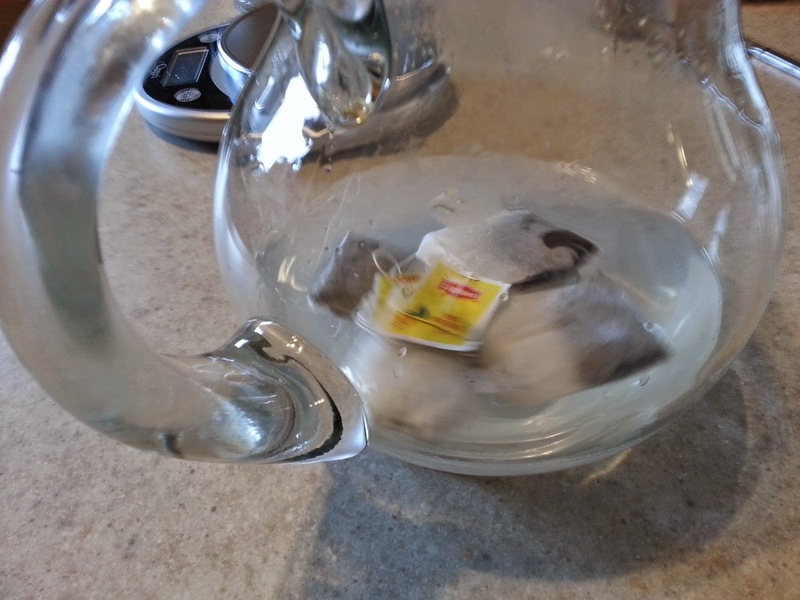 Pour the hot water from the microwave into your pitcher containing your sugar. 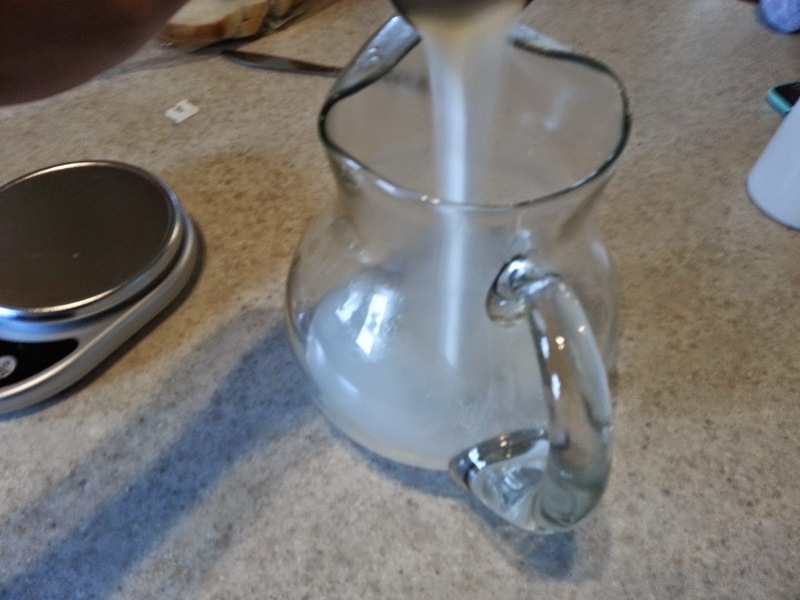 Mix until all sugar is dissolved. 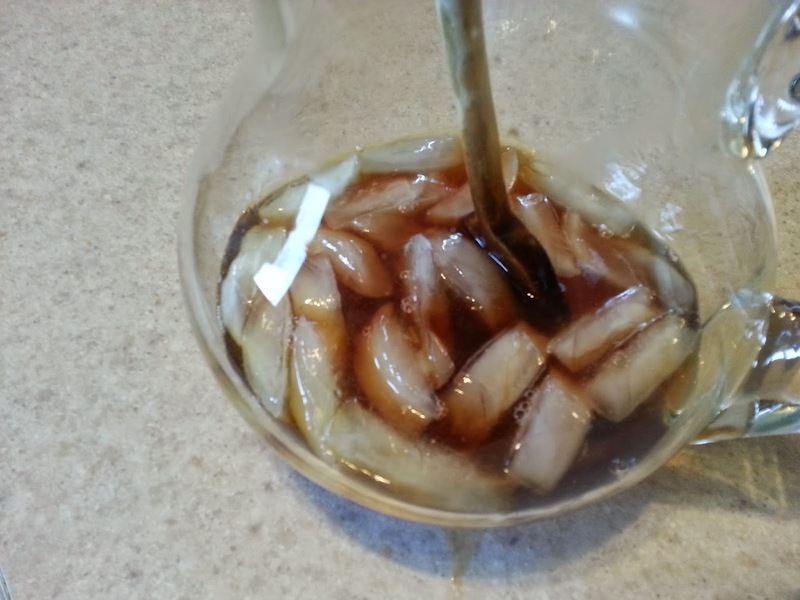 Add some ice cubes to your beverage to mouth delivery vehicle, pour you a nice tall glass of sweet tea, and enjoy. 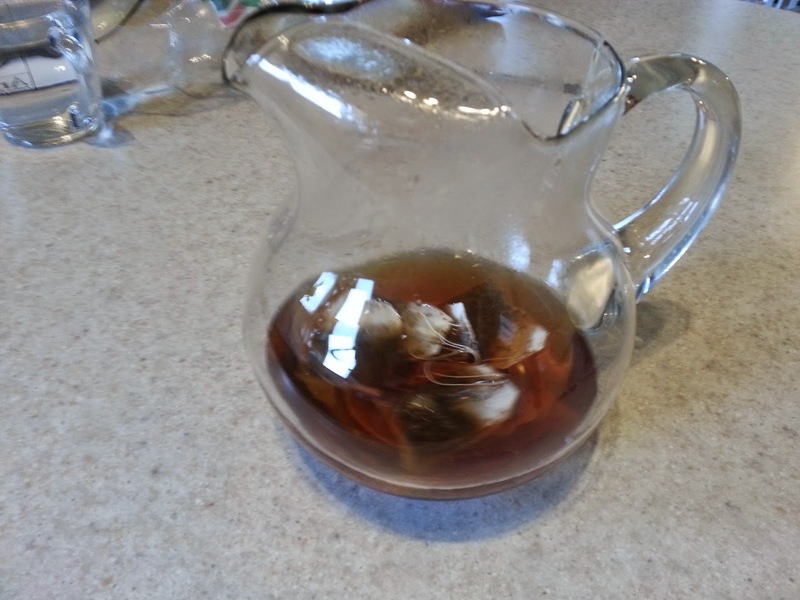 Notes: If anyone tries to make you add sugar to already prepared cold unsweetened tea, try not to hold this against them. 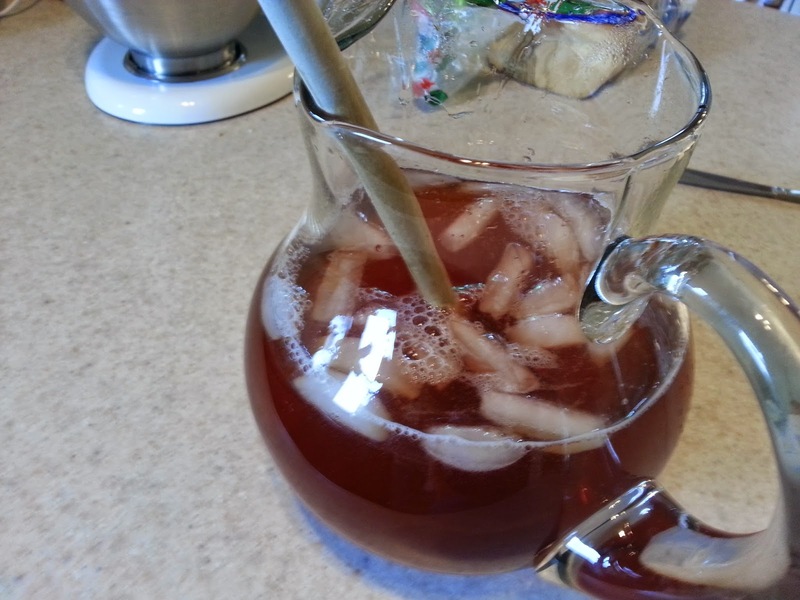 Show them the proper way to make sweet tea.